Well, as has typically been the way as of late, I have gotten a late start on getting the blog up and running for tonight’s game. I have been helping a co-media member buddy out with his STATS Inc. duties and we spent the past 45 minutes getting everything squared away that needed to be done for pre-game. Amazing to see how STATS gets all of the info that they need to pass on to clients around the sporting universe! Anyway… as you all already know, Chris Kunitz is again out of the line-up and I am pretty disappointed about it. The kid was playing some of the finest hockey of his career right up until the final moment of his last game. I really hope that this doesn’t derail what has been a pretty special season for him. It is also worth noting that the absence of Kunitz has again led to Evgeni Malkin being paired with Sidney Crosby on the Penguins’ top line. Overall, the early stages of this evening’s game have been much like we would have expected from these two teams. Each goalie has been forced to make a couple of big stops, each team has generated 6 shots on goal and their is still no score. As usual, I will be sharing a variety of thoughts, comments, and observations live from the CONSOL Energy Center… stay tuned! I have said it before and I will say it again tonight… Sean Avery annoys the heck out of me! I spend every game in which he skates here in Pittsburgh debating his merits with our pal Angie Carducci from Inside Hockey. She thinks he is great for the game… me? Not so much… especially when he is knocking guys down in traffic with cross checks as he did to Geno Malkin earlier in the period…. That sort of caught me off guard since I am born and raised in Pittsburgh and I told him as much. He said that he was told that I moved out of town and was pretty surprised to see me… strange brew! Sounds like someone was getting their stories crossed, or at least spinning a couple of yarns! Brent Johnson and Henrik Lundqvist have played very well thus far with Lundqvist seeing most of the action… the Rangers goaltender has faced 15 shots through one and allowed only the Malkin goal. By the way, I have been meaning to mention… the ARE YOU READY Penguin that is shown on the Jumbotron during the opening of the game has been wearing holiday regalia! They now have him dressed in an elf’s outfit and IT IS GLORIOUS! The Penguins have sold out another one… 18,242 in the house tonight. The Rags have held the Penguins to one shot through the first four minutes of the third period. Well, Arron Asham finally got Sean Avery to toss the mitts… it was a very underwhelming battle, as many of Avery’s scraps are. Not a lot of punches thrown… unless you count the ones that Avery threw as Asham was falling to the ice. I swear, I would probably dislike him a lot less if he wouldn’t do things like throw punches while a guy is laying on the ice. 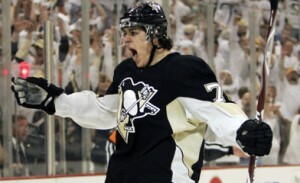 Malkin was a man possessed on the last series and it resulted in a Penguins goal… albeit one that has been disallowed. He was all over the zone, stayed on once the puck was cleared and danced into the zone… he made a great toe drag around a Rangers defender and threw the puck to the net from a 90 degree angle… Sidney Crosby deflected the puck in the front of the net and put it past Lunqvist, though the referee almost immediately waived it off. Pascal Dupuis was bring pushed by Michal Rozsival but did make contact with Hank… done deal, no goal.